In this presentation, I argue that the idea of the audiovisual surreal is helpful when unpacking a significant direction in recent audiovisual expression. My presentation summarizes and extends research that I undertook in the book, An Eye For Music: Popular Music and the Audiovisual Surreal (Oxford University Press, 2011). In this book, I bring theories on historical surrealism into conversation with ideas about emerging audiovisual practices, including independent cinema, live performances of popular music, cinematic opera, and Internet practices such as syncing and audiovisual mash-ups. Surrealism in this context is understood not as diametrically opposed to realism, but as arising out of perceptions of reality in a manner that encourages rather than effaces engagement with the experienced world. My discussion of the audiovisual neosurreal culminates in a four-part theorization that draws on the concepts of flows, interruptions, technologies and ghosts. In contrast to once-fashionable ideas about pastiche and the end of history, I pay heed to the role of cultural and collective memories in shaping our understanding of creative practices in an age in which the recycling of artefacts is prevalent. The ghosts of previous eras, I argue, resonate in many of the expressive forms we routinely think of as contemporary. 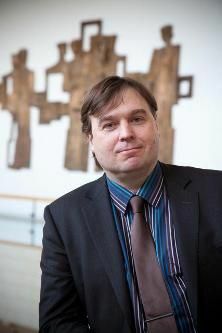 John Richardson is Professor and Chair of Musicology at the University of Turku in Finland. He is the author of An Eye for Music: Popular Music and the Audiovisual Surreal (Oxford University Press 2011) and Singing Archaeology: Philip Glass's Akhnaten (Wesleyan University Press 1999). He is co-editor of several books, including The Oxford Handbook of New Audiovisual Aesthetics (OUP 2013) and The Oxford Handbook of Sound and Image in Digital Media (OUP 2013). Richardson is director of the Turku-based International Institute for Popular Culture. He has worked at several Finnish universities as well as City University in London, the University of California at Los Angeles and De Montfort University, Leicester. His areas of expertise include popular music, musical multimedia, contemporary classical music and Finnish music.